To get ultimate enjoyment and maximum value from any of our Horse Riding Holidays, it is important that you choose one that is suitable for your level of horse riding experience. 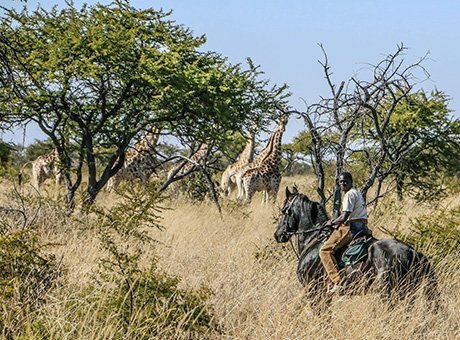 Our range of Horse Riding Holidays worldwide spans the full range of riding experience from trips suitable for people who have never even been in the saddle before, to challenging and lengthy treks for Advanced Riders only. 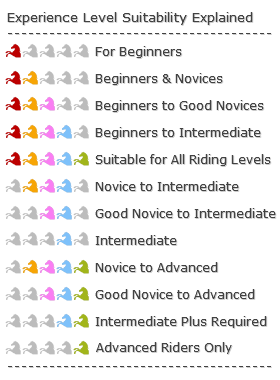 We have graded all our Horse Riding Holidays with a colour-coded scheme on this page, with rankings from Beginners to Advanced Riders. You’ll find the riding experience level on the detailed page of each of our Horse Riding Holidays. It is important that you check the level against your riding experience in addition to the ride level the holiday requires, which is also described. If you are not up to the level of the riding required and there is a risk to your safety, your horse or your fellow riders, you may be dismounted. Here is a broad description of the riding exeperience expected by level. You have never ridden before or have only ridden a few times. You have had some experience of riding, most probably some trekking at a walk or a trot. You are a brave rider who rides occasionally and can canter on a safe horse. You ride regularly or rode for a long time but may have not ridden regularly recently. You are very confident to ride different horses and can canter and be in control at a gallop in open countryside. You ride every day, you ride different horses confidently and like to ride forward going horses. You most probably compete or work to a high level in dressage, endurance, showjumping, xcountry or showing. If you have any queries on your riding level, please Contact Us for directly and ask for guidance. We’ve several decades of riding experience ourselves and we’ve also been on all our rides, so we know them intimately and we’ll be able to advise which is suitable for you. We guarantee we’ll help you make the right choice if you give us a true description of your riding experience to date!